Transformer oils are mineral oils of high purity and low viscosity. These oil are used in power transformers, voltage and current measurement transformers, oil filled connectors and switches, etc. Transformer oil is a dielectric insulator, separating energized components of the transformer. It helps dissipate the heat from the transformer core and protects solid insulation from air and moisture. Testing and analysis of transformer oil, used in any type of high voltage equipment, are regulated (with recommendations issued by the appropriate authority) in schedule and scope. Neglecting transformer oil change or filtration causes accelerated oxidation of the oil and damage to the internal components of the equipment, which may lead to equipment malfunction and downtime. Sedimentation on windings, permeation of the solid insulation with contaminants, acid, alkali and water all adversely influence the equipment, clog outlets and cause overheating. The rate of transformer aging depends on its type, additives in the oil, operating temperature range and the amount of water and contaminants inside the transformer. 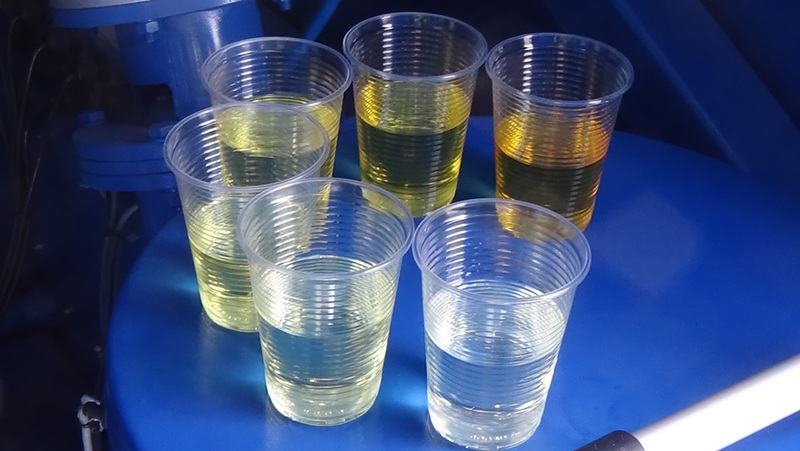 Transformer oil testing indicates its quality and purity, its dielectric strength and the condition of the electrical equipment and its components. Transformer oil test is performed in two stages: taking an oil sample for gas analysis, and then abbreviated or full analysis of the oil. The abbreviated procedure is the simpler method and does not require complicated operations or calculations. The parameters checked are color, particulate matter content, purity class, moisture content, dielectric strength, acidity, flashpoint and the amount of solved acids and alkali. The results of the analysis shows the degree of oil contamination and aging, the condition of solid insulation and the presence of volatile fractions. The abbreviated analysis is sufficient to make a decision concerning the need to purify, dehydrate and degas the fluid. The full analysis procedure includes the abbreviated one, calculating additional parameters: dissipation factor, antioxidation additive content, water soluble sludge and furan content, oxidation stability and total gas content, a gas chromatography analysis and kinetic viscosity. The parameters tested allow to determine the oil’s performance quality and its ability to act as a heat dissipator and a dielectric. Poor results of the tests indicate the need for immediate filtration and, if possible, regeneration of oil. Timely detection and reaction to transformer oil problems facilitates reliable operation of the equipment, while failing to analyse the fluid or ignoring the results will lead to damage and major malfunctions of the system, which may even require overhaul.